Peter Thiel, the controversial tech billionaire and co-founder of Pay Pal, is putting his money where his mouth is, donating more than $1 million to Donald Trump’s beleaguered presidential campaign. The New York Times reported on Saturday that Thiel would donate $1.25 million to Trump through super-pacs and in direct donations to his campaign. Thiel, who spoke at the Republican National Convention, is the most prominent Trump supporter in Silicon Valley; in his campaign contribution, Thiel puts to rest months of speculation as to why he hadn’t provided Trump with more monetary support. 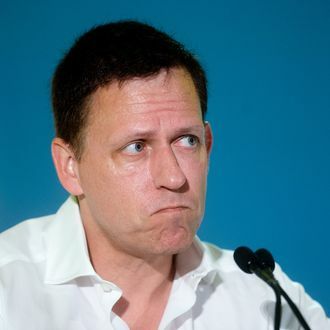 As late as August, a spokesperson for Thiel said that he had not planned to contribute to the campaign. Trump and Thiel both have similarly fraught relationships with the media. Aside from his work in the tech industry, Thiel is perhaps most well-known as the secret bankroller behind a highly publicized lawsuit brought against Gawker Media by professional wrestler Hulk Hogan. Thiel is estimated to have spent $10 million on the lawsuit, which ultimately bankrupted the company, shuttering Gawker’s flagship website. Thiel has so far refused to comment about the donation.